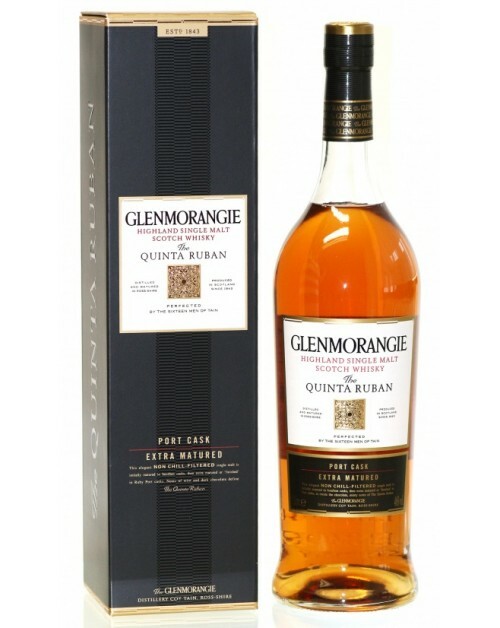 Glenmorangie 12 Year Old Quinta Ruban Single Malt Whisky is the darkest and most intense whisky in Glenmorangie's extra matured range. Quinta Ruban spent 10 years maturing in American white oak casks, before being transferred into specially selected ruby port pipes from the Quintas or wine estates of Portugal. A terrific port finished whisky. Nose: Dark mint chocolate, tangerines and oranges liaise with sandalwood and walnut before yielding to a spicy finish of pepper and nutmeg. Palate: Mint chocolate and walnuts wrap the palate, preparing the way for rose, Turkish delight and sweet oranges. Finish: Long; leaving traces of dark chocolate mints and notes of orange.